Spray on sunscreen has revolutionized my life at the beach. I always had good intentions about reapplying, but the cycle went something like this: I’m laying in the sun; I notice I’m hot; I remember I should reapply, but I also want to go for a swim. I don’t want to wash all the sunscreen off, so I wait until after my swim. I lay in the sun to dry off, all cooled down, feel refreshed and forget to reapply. Repeat until skin has reached lobster levels of red. Not anymore. Spray on sunscreen is such a breeze to put on that I do a full body spritz whenever I think of it. It takes less than 5 minutes, you don’t have to rub it in if you’re half covered in sand, and you can spray it on right after you get out of the water while your skin is wet. Since I started using it, I haven’t gotten a sun burn (quite the miracle for someone with skin as fair as mine). But, that’s when I’m at the beach, and I don’t mind coating myself in a cloud of shiny sunblock. In everyday life, reapplying my sunscreen is much trickier. Even though we all know that the SPF in our morning moisturizer isn’t enough protection for a full day, after applying makeup, and doing my hair before work, I’m not likely to remove it, put on more sunscreen, and re-do halfway through the day. The fact remains that sunscreen loses its effectiveness after 90 minutes in the sun, and my unwillingness to reapply over my morning makeup foundation may have opened me up to risk of overexposure. 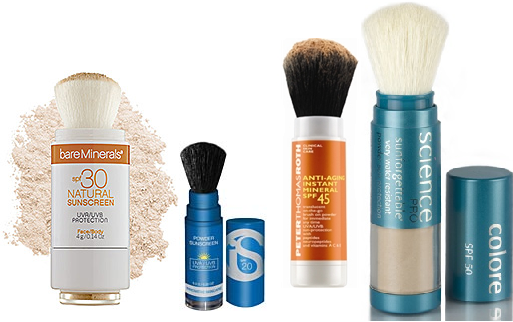 Finally the beauty industry has come up with a solution: powder sunscreens that provide broad-spectrum protection through micronized zinc oxide and titanium dioxide that layer on INVISIBLY over your make-up. 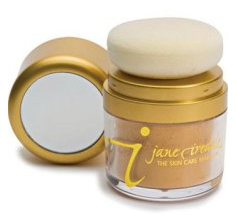 You can even purchase some with a hint of bronzer for a little faux-tan glow with your sunscreen. The powders contain ingredients like silica and cornstarch to combat summer sweaty face, and have a matte finish similar to what you’d achieve with a midday blotting paper. So far I’ve seen tubes from Bare Minerals, Jane Iredale, Innovative Skincare, Peter Thomas Roth, and Colorescience Sunforgettable. More and more are popping up all over the market. They come with a built in brush to toss in your purse-no extra tools needed. Now reapplying is a cinch, on and off the beach.